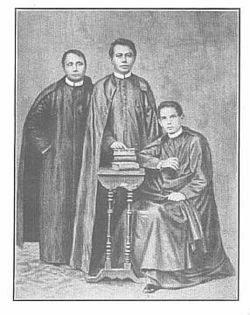 On this date in 1872, reformist Filipino priests Mariano Gomez, Jose Burgos and Jacinto Zamora (together, the first syllables of their surname formed the acronym “Gomburza”) were garroted in Manila for their alleged support of an anti-Spanish mutiny. These three clerics were leading exponents of liberalization; they notably pressed the rights of the native-born clergy as against the powerful religious hierarchy of imported Spanish priests. While that critique had a somewhat receptive ear under the forward-thinking governorship of Gen. Carlos-Maria de la Torre, a more reactionary successor did not look as kindly on such agitation. When naval shipyard workers rebelled in the 1872 Cavite Mutiny — over higher taxes, including a surcharge to avoid forced labor, not over the Gomburza priests’ agenda as such — the colonial administration used it as a pretext to seized the priests and condemn them for subversion. Alas, Spain couldn’t manage to garrote away its subject peoples’ aspirations. A bad end for Gomez, Burgos and Zamora was just the start for reform and independence agitation in the Philippines.